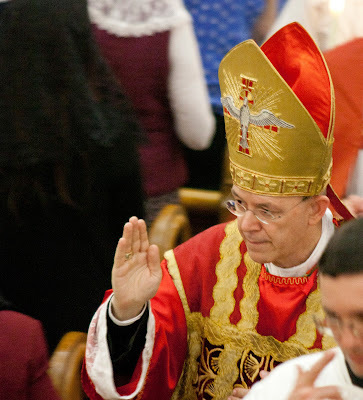 Today NLM is pleased to publish the sermon preached by Bishop Athanasius Schneider on May 30, 2018, at the Pontifical Low Mass offered in St. Anthony of Padua Catholic Church in Winnipeg, Canada. We are grateful to His Excellency for the permission to share these inspiring words with our readers. When we recognize and really believe in what each Holy Mass is, then every detail of the rite of the Holy Mass, every word, every gesture is important, is deeply meaningful and spiritual. Even from the moment we enter a church to participate in the Holy Mass, we have to try to lift up our mind and heart to Golgotha and to the heavenly liturgy. Blessed Cardinal John Henry Newman wrote: “The Catholic Church alone is beautiful. The celebrant, deacon and subdeacon, acolytes with lights, the incense, and the chanting — all combine to one end, one act of worship. You feel it is really a worshipping; every sense, eyes, ears, smell, are made to know that worship is going on. The choir singing out the Kyrie, and the priest and his assistants bowing low, and saying the Confiteor. This is worship, and it is far above reason” (words of Mr. White in the novel Loss and Gain). Saint Peter Julian Eymard said: “Why has our Lord willed to establish so close a relation between the Sacrament of the Eucharist and His death? It was, in the first place, to remind us of the price His Sacrament cost Him. The Eucharist, in fact, is the fruit of the death of Jesus. The Eucharist is a testament, a legacy, which becomes valid only at the death of the testator. To give His testament legal force, Jesus had then to die. Every time we come into the presence of the Eucharist, we may therefore say: ‘This precious testament cost Jesus Christ His life; He thereby shows us His boundless love, for He Himself said there is no greater proof of love than to lay down one’s life for one’s friends. Jesus gave me the greatest proof of His love when He went to His death in order to make the Eucharist possible and give it to me. How many think of this price paid for the Eucharist? And yet Jesus is there to remind us of it. But like unnatural children we are bent only on using and enjoying our riches, without ever thinking of the One Who acquired them for us at the cost of His life” (The Real Presence. Eucharistic Meditations, ch. XIII). Dear brothers and sisters, let us receive the Eucharistic Lord with love, with purity of heart, with a gesture of adoration kneeling down, with a gesture of humility and littleness opening our mouth and receiving the Holiest of Holies, the King of the universe, in the little sacred Host. O Lord, when we have You in the Eucharist, we have all things and we want for nothing. Amen.